The long standing superior quality of Bridgestone tracks has been a well established fact in the OEM and replacement markets for many years. It is essential to maintain the correct tension on your tracks at all times. Check your vehicle operating manual for details. Periodically check the undercarriage components (i.e. sprocket, rlilers and idler) for wear. 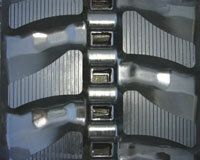 Wear and damage of the undercarriage components can affect track performance and durability. 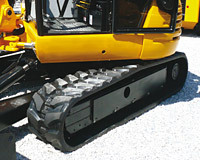 Limit the use of your vehicle on large, sharp rocky surfaces and sharp steel edges. Avoid fast sharp turns and side slope turns. Prevent large foreign objects from becoming entangled in your undercarriage. Do not drive with track sidewall edges pressing against hard walls, curbs and other objects. If oil or a similar product gets on the track, it should be removed. 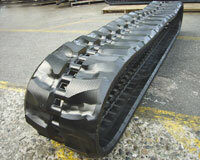 Over time, oil will degrade the rubber quality. When storing your vehicle for a period of time, it should be kept indoors away from rain and direct sunlight in order to prliong the life of the Rubber Tracks.